Nestled under the grand oaks bordering hole #5 of Sea island's Plantation golf course, this Telluride, Colorado inspired home exudes a casual outdoor lifestyle. Designed by Chad Goering and built by Brad Brumbach, the open floor plan in the great room has two notable focal points: A twenty-seven foot ceiling accented by a six-foot iron chandelier, hand forged by local artisan, Steve Schoettle, and "Beauregard", a prized trophy elk, bagged by the homeowner. This beauty adorns the floor-to-ceiling stone fireplace. The beams throughout are heart pine and the floors are antique white oak. Years of living casually in the mountains of Telluride inspired the openness of this floor plan. All of the active living spaces face the golf course and the St Simons sound in the distance, drawing guests through the expansive glass doors to the outdoors beyond. 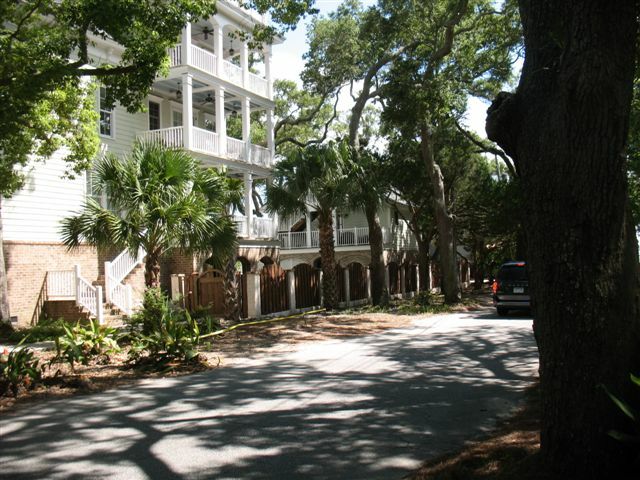 Come, step outside and enjoy the shade of the oaks and the gentle breeze off the sound. 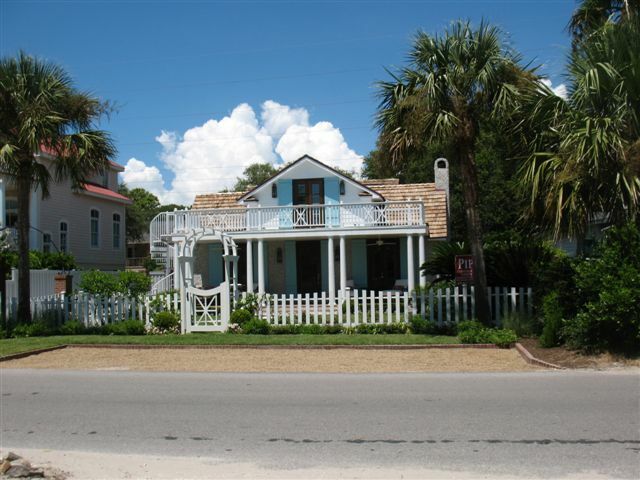 Tucked onto a double corner lot across from the St. Simons lighthouse, this charmer has every option included for complete relaxation and enjoyment. Robert Ussery designed the main house and Thad Truett designed the pool house, pool and fence. Built by Sea Oaks, Inc., it incorporates many features for comfort and practicality as well as quality construction throughout. It includes all of the amenities of a luxury home today with a complimentary nod to past architectural designs. 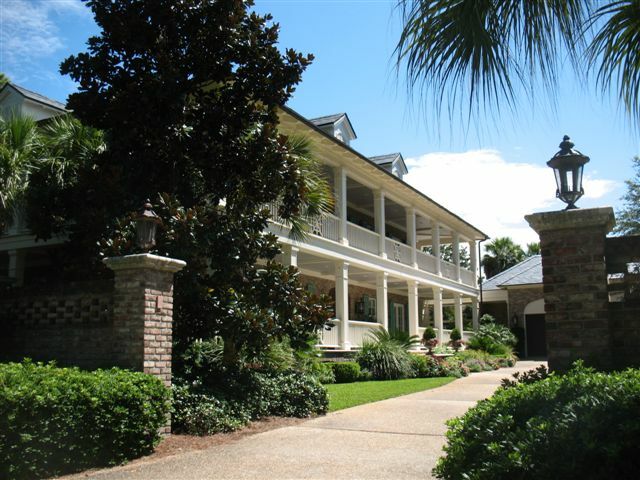 With porches on each level to catch ocean breezes, it has the elements of a Charleston, SC �single� house. The design also has details of the lighthouse keeper�s cottage across the street and blends well into this vintage section of St. Simons. The communal level has a comfortable sitting area adjacent to a nautical themed kitchen. The neutral tones with touches of shades of blue make for a stress free environment. A guest room and bath complete this level. The next level offers two additional bedrooms and baths with a sitting area for reading, television watching, or good conversation. The third level is a complete master suite � a perfect hideaway to relax and chill out. Not to be missed is a rooftop getaway complete with a fire pit, comfortable seating and unbelievable views. Right at treetop level, this retreat is a perfect spot to welcome the sunrise or toast the sunset. Underneath all of the above is a fabulous outdoor kitchen which is a perfect spot for entertaining and cooking out. A low maintenance yard, surrounded by a cedar and tabby fence, shuts out the rest of the world for perfect privacy and relaxation. An in-ground pool connects the main house to a �party house� where a player piano keeps the ivories tinkling for another spot to enjoy some lovely Island views. Not to be outdone, the party house also has a rooftop spot to enjoy the sights of St. Simons Sound as well as an outdoor shower tucked out of sight at ground level. With ample garage parking, this home has it all � very well planned with every comfort for easy living!!! This gem in a vintage East Beach cottage has all of the ingredients for easy beach living. Called �Little Sandcastle� by its owners, it was totally gutted by Pipe Construction and decorated by Elizabeth Smith Interiors. It has been transformed on the inside to an open, bright house while keeping its outside vintage charms. So many clever ideas for expanding the available space have been incorporated that the house feels much bigger than it is. Nestled at the almost end of East Beach, its fenced entry garden leads the visitor to a wonderful porch where a swing and comfortable chairs give the first clue of what is to come. With a tabby background on the exterior walls and pale turquoise shutters to set the main color choice, splashes of oranges in fabrics play off the high gloss white used on walls and fabrics throughout the house. Even the bicycles are orange and turquoise to carry out the color scheme! An open living area flows to a dining space where family style dining and entertaining can take on small or large groups. A well planned kitchen has all the elements for conversation with the cook or lending a helping hand. A backsplash of blues and greens in glass tile provide color as well as an easy maintenance surface. On the left of the living room is a study that can double as extra guest quarters with a full bath to serve the downstairs. The master bedroom continues on this side of the house with its own privacy and comfort. The master bath has glass bubbles set in the tile. A cleverly planned laundry room can be disguised from its real purpose or quickly transformed into a convenient space for the necessities of running a home. A private porch is a perfect hideaway to read and enjoy a gentle breeze as well as a quick way back to the front or rear of the house. An inviting pool and deck are convenient for a quick dip or a leisurely nap on vintage chaise lounges placed around the pool deck. A pair of mermaid light fixtures, original to the house, is on the porch leading to the pool from the kitchen. 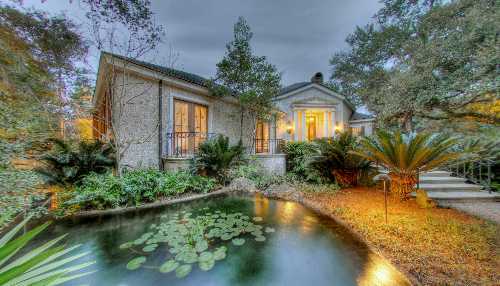 A delightful guest house and bath provide wonderful accommodations for extra company or can do double duty as a pool house. Shiplap siding inside the guest house and main house give a crisp, clean, but casual backdrop for artwork or displays. The gutted attic upstairs provides additional space for two guest rooms and bath. A sundeck over the front porch can be accessed from the front attic guest bedroom or from a circular stair on the outside which allows its access for other occupants. A coveted view of Gould�s inlet is the prize. This little treasure lives large in its transformation. Sometimes the best things come in small packages! Completed in 2013 and built on an old, but expanded footprint is this Mizner style, Mediterranean architecture cottage--popular in the early days of Sea Island and reflected again today in the nearby Cloister Hotel. The owners, together with architect Thad Truett and builder Clif Pease, collaborated on an elegant beach house with nods to the old and embracing the new. Two vintage sculpted oaks form a perfect canopy to welcome guests to the front door. A path composed of brick-bordered fossilized stone leads to a sturdy front door and entry into the house. Chiseled limestone floors, textured plaster walls, and magnificent corbelled beams dominate the interior space. Vintage wood timbers on ceilings throughout the house were recycled from a late 19th Century factory in Virginia. From the entry, downward steps lead to two separate hallways leading to bedroom suites--with the master suite to the right. The master bedroom has vintage chamfered pine beams on the ceiling and hickory floors, both an appealing contrast to the bright, white walls. A view through the French doors of the covered east loggia and pool garden provides a soothing venue for relaxation and de-stressing. Across the hallway is the entrance to a private guest suite, with a separate door leading to the west loggia and manicured gardens shaded by a sculpted oak tree. Upstairs an office and a vaulted ceiling media room, from which a corner, cantilevered balcony gives a beach view, provide a private retreat for business and fun. Returning to the center entry, an arched doorway leads into a handsome two story salon which is the main living area of the home. Overlooking the salon, at each end, are two �Princess� balconies with hand wrought iron railings; both visually connect the upstairs wings of the house. Sculpted archways provide definition and architectural interest above the fireplace and frame the French doors leading to the garden loggia and pool area. A lovely basket-weave design in the east loggia�s brick floor gives a pleasing texture. Stacked tile on top of a solid wall surrounds the pool garden. The front garden entrance door is one saved from the original house and the copper roof pergola provides a shady retreat for swimmers and sun-worshippers. 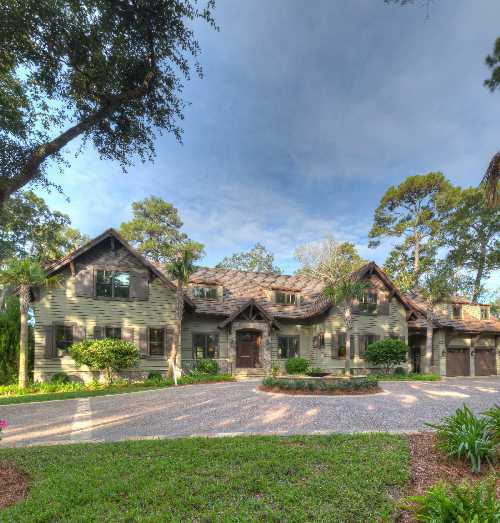 The exterior of the home is textured stucco with dark timbers on the second floor providing a �Tudor� effect; a stacked, terra cotta tile roof complete the Mediterranean look. Returning to the inside and at the far end of the salon, past the dining room, are several archways. Turning right leads into the kitchen. Bricks adorn the backsplash and a custom, seeded glass window provides a filtered view of the dining room. Turning left leads to the back foyer and on to the �beach� room essential for cleaning sandy feet--and where towels can be laundered--before entering. A pool bath doubles for extra guests as well. Upstairs hosts a generous media area and two additional bedroom suites for a separate private retreat. Be sure to look for the antique clawfoot tub in the back bath--it was saved from the original house. Throughout the house are cypress doors constructed locally. Windows in the house were imported from Italy and can be tilted to catch breezes. Antique iron sconces, vintage gas-to-electric chandeliers, fabulous salvaged wood beams juxtaposed with textured plaster walls all combine to complement each other and exude quality and craftsmanship at every turn. This house is a sensory delight! This beach front cottage, designed by Jim Sutton and decorated by Elizabeth Smith Interiors, is a feast for the eyes at every turn. It is reminiscent of a �Showcase� home where every room is unique and original � although a distinct beach/tropical theme comes through in colors used and objets d�art seen throughout. It also has elements of a Southern plantation home with its wide, surround porches upstairs and down, and views essentially from every aperture. The entry hall with its heart pine floors leads into the spacious living room with a breathtaking vista of open ground to the ocean, dotted only by stately pines. A pool recreation area is tucked around to the right. Shades of blues and greens can be seen throughout the interior: Lush fabrics, custom designed rugs; Delft tiles around the fireplace - all help to convey the beach theme. The adjacent kitchen is open and inviting � definitely a welcoming place � with its cottage style cabinets and painted octagon shaped bead-board ceiling above the table. A wonderful shell chandelier completes the picture. The dining room has an Oscar de la Renta design 84� round table with unique removable leaves. A collection of antique Majolica oyster plates and jardini�re are eye-catching. A beaded chandelier and sconces repeat the blue and green color theme. Two lovely guest bedrooms complete the downstairs. A stately, wide staircase leads upstairs where there are three additional bedrooms, each with its own theme � from Hawaiian surfing and carved pelican bedsteads to a very pink bedroom with flamingo touches and a canopied sitting area with antique settee. The master bedroom has a not to miss magnificent shell mantle, with shells repeated in the fabrics and on Mottahedeh plates in paired bookshelves. A study with an antique partner�s desk provides a quiet retreat for reading and reflection. The owner describes this house as her �whimsical beach house.� It is that, but also a delight to savor and enjoy. This traditional styled tabby cottage is full of surprises from the entrance to the exit. With its front sited at an angle to the street, its first surprise is a koi pond flowing under the front entry walk. Once inside, surprises abound. Immediately, the bright light from walls of windows, which come to a right angle in the living room, reveal the �retro� feel of the Art Deco era in furnishings and light fixtures. Wonderful, eclectic original art displays well on the neutral walls and sculptures of metal and crystal adorn chests and tables. A tabby tile floor provides the perfect background for muted Oriental rugs placed throughout the house. A master suite to the right has all the comforts one could want in a private wing of the home. To the left is a dining area with a round table for great conversation, also with two of its walls comprised of windows. A convenient bar at the corner has all the accoutrements for making tasty libations. A wine cabinet is cleverly tucked into the wall adjacent to the bar. Two bedrooms and baths complete this part of the house. A latticed covered lanai skirts around the entire back of the house and gives pleasing views to the rooms of the interior. A hearty wisteria vine intertwines on the top to give shade, but not obscurity to the deck. A totally renovated kitchen and family room combination add an upbeat, comfortable area for informality and relaxation. With the assistance of Laurie Watson with Mary Bryan Peyer Designs, Inc., this entire area has been recently renovated to reflect the lifestyle of the owner. A former garden room with a barrel-shaped ceiling has become a useful butler�s pantry, complete with a fabulous collection of copper pans. Tabby walls and a travertine marble floor create appealing opposing textures. The kitchen has all the elements for the gourmet chef as well as plenty of room for guests to linger for good conversation and possible taste tests. Dark beams on a pitched ceiling give a dramatic �wow� to the sitting area. A wide loggia connects to the refurbished guest suite as well as to two bonus room areas � one another guest suite and the second a great area to escape to watch movies or listen to music in quiet comfort. Interesting elliptical notches from the dormer windows form an unusual design finishing at a point in the ceiling. This refreshed and updated home exudes originality and oomph. The guests might never leave! 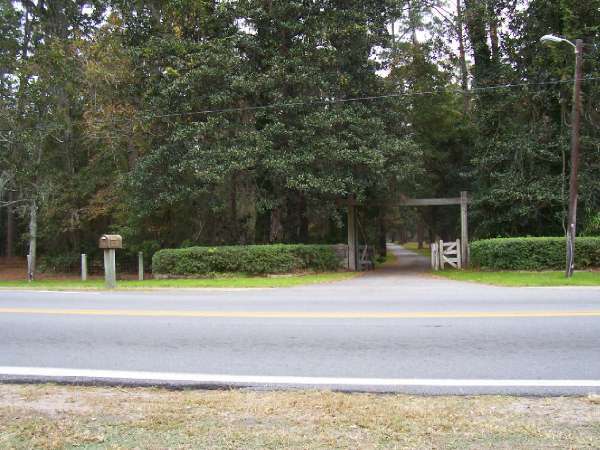 The Village Creek Cemetery lies on the east side of the property where only the descendents of slaves are permitted to rest along with their ancestors. Mrs. Reynolds passed Musgrove Plantation down to Smith Bagley, her son, and Mr. Bagley was buried at this historic site upon his passing in January 2010 with special dispensation given b y those families. This year, we bring to life our historic cemetery with a formal tour as one of our stops. 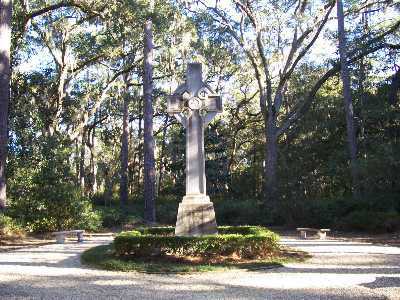 At stations throughout the grounds, re-enactors will tell the stories of some of the interesting personalities buried there. You will meet Raymond Demere from the American Revolution; Anna Matilda Page King, mistress of Retreat Plantation; Rev. and Mrs. Anson Greene Phelps Dodge, rebuilder of the church; Horace Bunch Gould, 19th century land owner; Howard Coffin, northern industrialist and Sea Island founder; Eugenia Price, author of books on St. Simons; Furman Bisher, nationally renowned columnist; and find why Dr. Hazzard shot Mr. Wylly during the 1830�s.